Hello there! 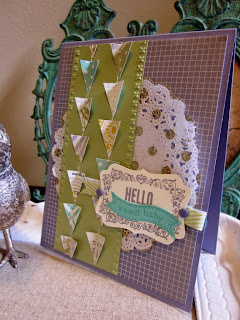 Today's card is my goddess card for the Stampin' Royalty weekly challenge blog. 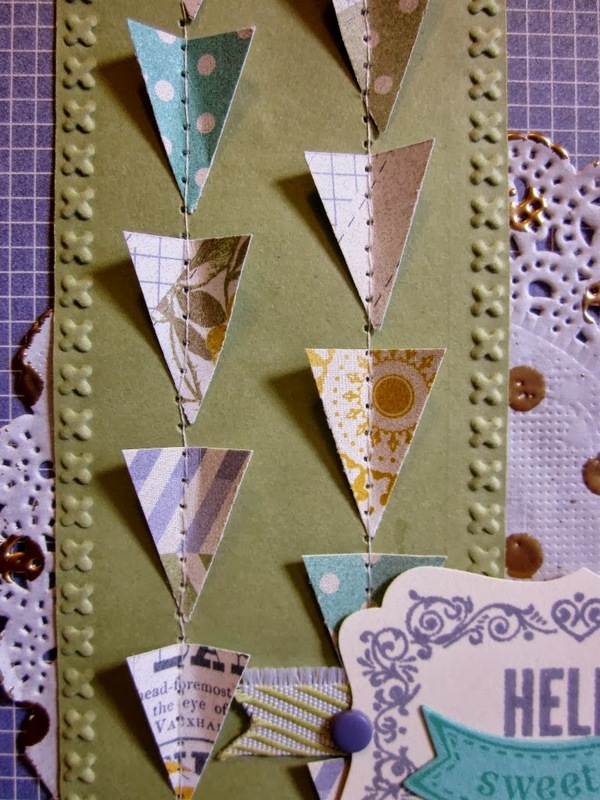 This week we are focusing on Trendy Triangles. 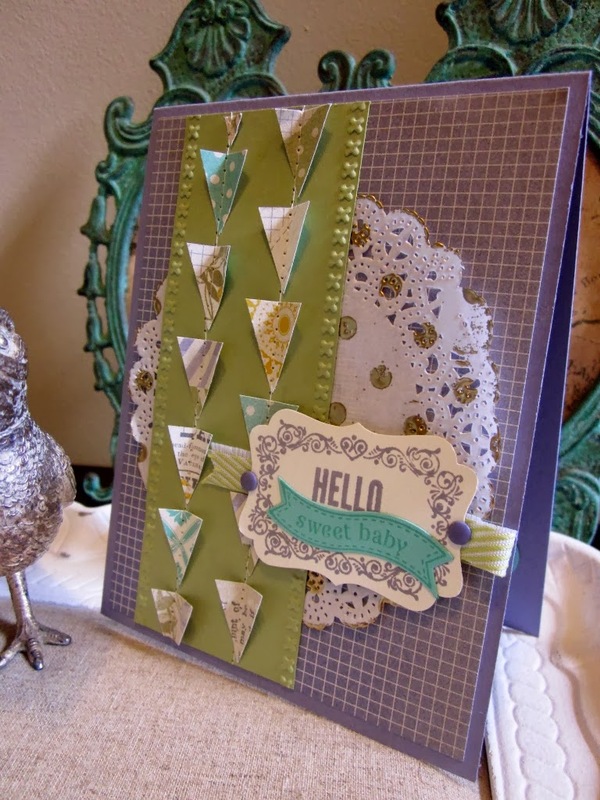 Grab your provisions, create something trendy and head on over to the Stampin' Royalty to link it up! 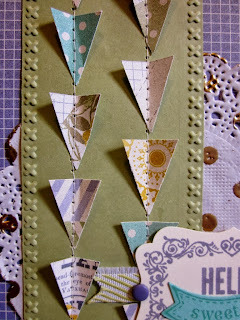 Triangles and gold embossing are everywhere in the craft world, I seriously cannot stop heat embossing in gold. It has become my new favorite accessory. 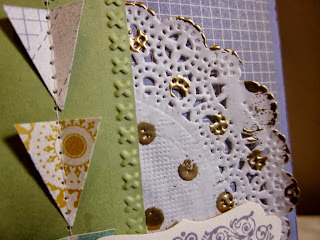 Here I heat embossed gold polka dots on my tea lace paper doily. Love it! Triangles anyone? I flipped them upside down, and sewed them on to my pear pizazz card stock that was already embossed with the needlepoint border embossing folder. How did I get perfect bitty triangles you ask? Very simple, I took my petite pennants builder punch and drew a line on the back of the punch where you can see what you are punching, about half way down the regular pennant punch. Then it was easy lining up my Afternoon Picnic DSP patterns that I selected. There was hardly any waste this way, and perfect triangles every time. 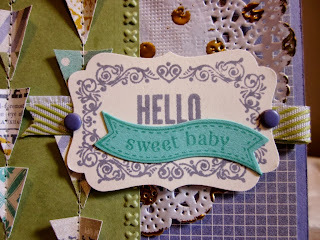 A fun decorative label punch was stamped with both the Hello Lovely and Itty Bitty Banners stamp sets, then punched and die cut with the matching bitty banners framelits. Add in some pear pizazz chevron ribbon and some candy dots and you are done. 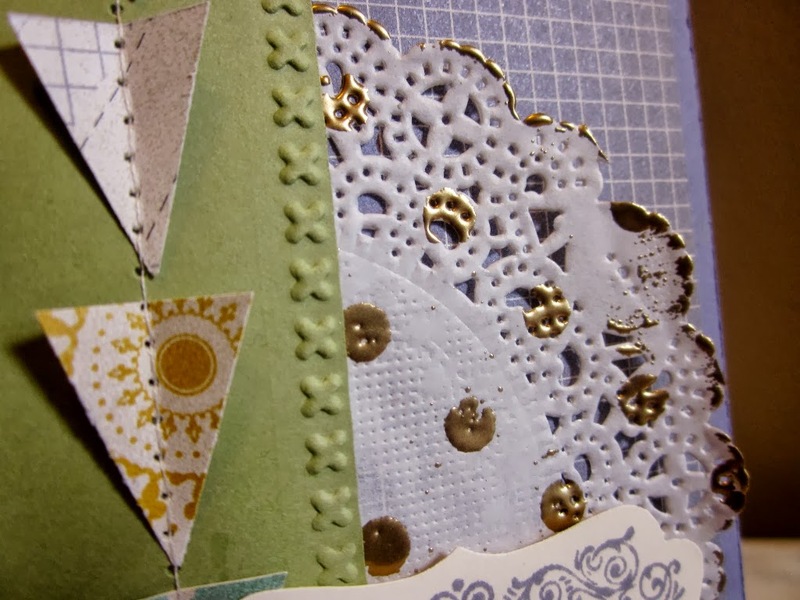 Off this card goes to a special recipient, I love to be able to customize cards to fit my needs, it is so fun and makes for a very thoughtful surprise. 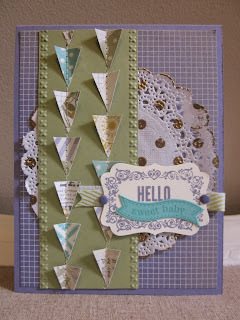 So what do you think of the triangles or pennants? I do love to use them, the ways are endless. Thanks so much for stopping by today, I hope you were inspired, enjoy! Magnetic Platform back in stock!